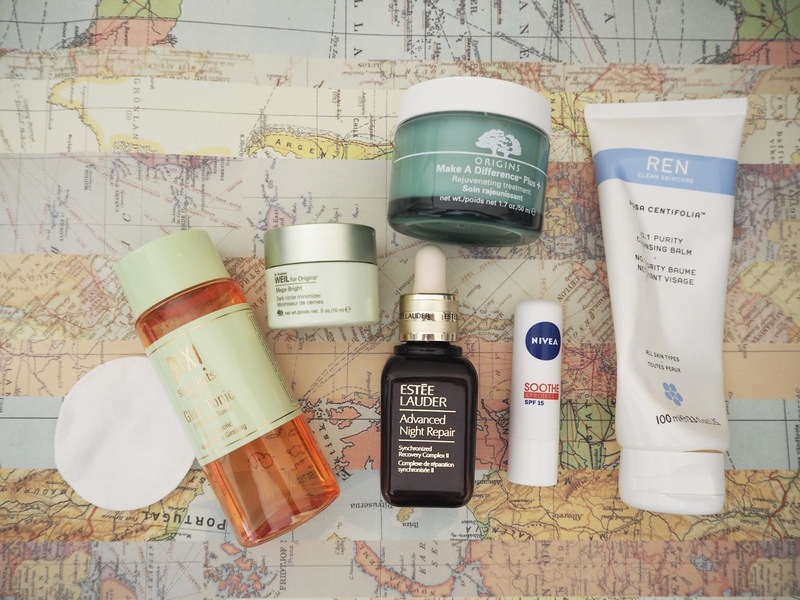 Following on from My Morning Routine post, today I'm sharing my evening skincare routine. Depending on how tired I am / how lazy I feel, my evening skincare routine can range from me simply washing off my makeup and going straight to bed, to a full routine like the one below. I do try to do the full routine every night as I know my skin looks better when I stick to it, but you know how it is, sometimes I just can't be arsed! So I start by removing my makeup with the REN No1 Purity Cleansing Balm. I LOVE this - it strips off all traces of makeup including tough mascara, in one go. I generally put some balm on the back of my hand and rub in circles to melt before applying all over my face and eyes. If you add a bit of water then the balm turns into a milk which you can wipe off with a damp muslin cloth. I try to remember to double cleanse in the evening, although if I'm honest I probably do it once a week...! When I do, I use the Vichy 3 in 1 Cleanser (which I'll be reviewing later this month). Cleansing done, back in the bedroom I firstly apply the Pixi Glow Tonic on a cotton pad (again, a full review of this is coming later in FEBeauty!). Next is the Estee Lauder Advanced Night Repair serum, I love this - I feel like it's a proper treat for the skin and my face feels sooooo good the next morning. Once the serum has properly sunk in I move onto moisturiser and my all time fave, the Origins Make a Difference+ Treatment. This has been the only moisturiser I've used for the past 3 years, it is THE BEST. If you like gel formulas that sink in quickly then you'll love it too. Onto eyes next and, once again, when I remember, I use the Origins Mega-Bright Dark Circle Minimiser. I can't say I've seen a reduction in dark circles since using this, but it does feel nice and cooling on the eye. I'm quite new to eye products so if you've got any recommendations let me know! Thats quite a routine! Im scouring the internet for gifts for the other half come birthday time and knew you would have good products listed on your blog. Thanks for sharing your info. Kind regards, Ross. yay! thanks for the recommendations, I absolutely ADORE buying and trying out new skin care products! Hello I'm Lynne, welcome to my little slice of the internet! Cocktails & Daydreams is an Edinburgh based lifestyle blog with a bit of everything from interiors to beauty to travel to food and fashion.